Hawaii Wedding Planner, Hawaii Wedding Coordinator, Katy Castillo Weddings: Sake & Sushi for a Good Cause!! Sake & Sushi for a Good Cause!! Alicia Hollinger from Milestone Events Hawaii is teaming up with Tokoname Restaurant and Sushi Bar in Kailua for a great cause. 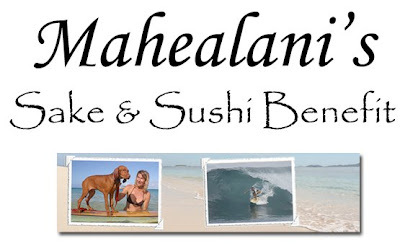 This benefit is for a great lady with a rare cancer, Mahealani Holzman has Burkitt's Lymphoma. Offered at the benefit will be some great sake and sushi, also local businesses from Kailua will be raffling off goods and certificates. All the proceeds from this event will go to her and her family for the medical expenses. Tickets are $45 . The date is Wednesday April 29 from 6 -8pm. Call now to reserve your tickets 262-8656.